0V – 5V analogue output of PAR & temperature signals. 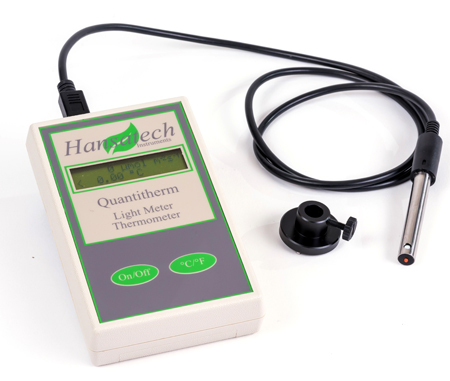 The Quantitherm consists of the QRT1 handheld display unit combined with the QTP1+ probe sensor. 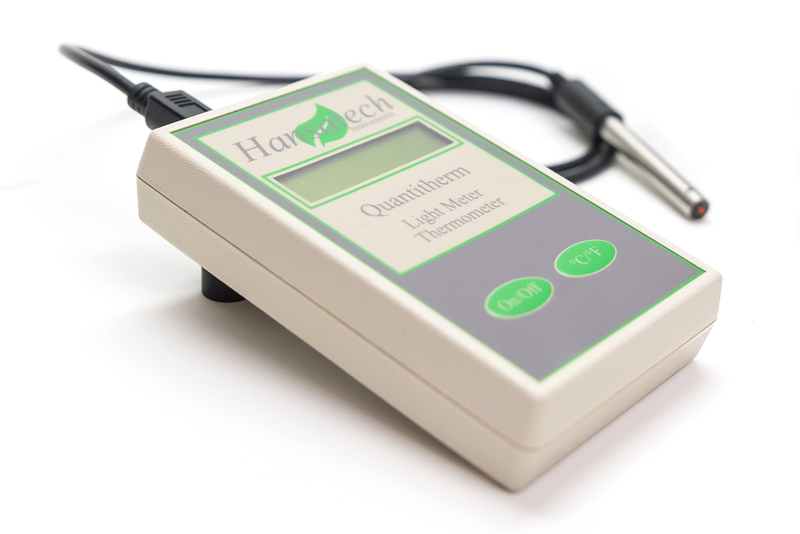 For use as a calibration tool for the LS2 light source, the QTP1+ probe connects directly to the QRT1 control unit allowing real-time measurement of light intensity via the built-in screen. The light intensity of the LS2 Light source can then be adjusted using the neutral density filters provided. 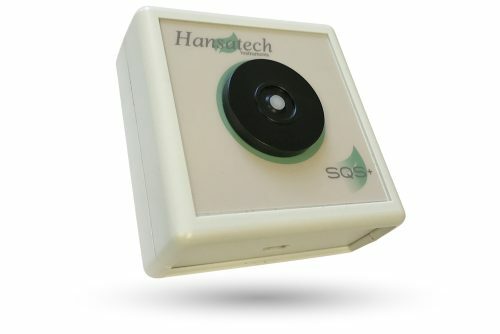 The QRT1 quantum sensor provides a displayed resolution of 1 µmol m-2 s-1 throughout the 0 µmol m-2 s-1 – 5,000 µmol m-2 s-1 range and up to a maximum of 50,000 µmol m-2 s-1 with a displayed resolution of 10 µmol m-2 s-1. The QTP1+ probe sensor connects to the QRT1 control unit via a Mini-DIN connection. The probe is designed to be mounted directly into the DW1, DW1/AD, DW2/2, DW3 and Oxytherm+ electrode chambers via the use of suitable mounting collars (mounting collar for DW1 and DW2/2 supplied, collars for DW3 and Oxytherm+ supplied with respective items). Despite being intended for light source calibration in liquid-phase oxygen electrode chambers, the PAR/temperature probe sensor must not be submerged in liquid. Although the probe is splash proof, prolonged contact with liquid will irreversibly damage the sensor. Calibration of light sources should be performed prior to the addition of samples. Damage caused by submersion will not be covered by warranty. The probe consists of a PAR quantum sensor and a thermistor bead for temperature measurement and is constructed from stainless steel and acetal. Temperature is measured by an RT curve matched-type glass bead thermistor mounted centrally in the probe tip. Photosynthetically Active Radiation (PAR) levels are determined by a quantum sensor located in the side wall of the probe. The QTP1+ probe may also be connected directly to the rear of the Oxylab+ oxygen electrode control unit. OxyTrace+ software plots the temperature signal from the QTP1+ in real-time as a chart recorder emulation on the same screen as the signal from the S1 oxygen electrode disc. 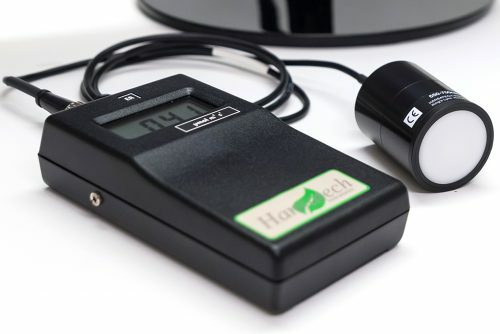 PAR values are also displayed in the OxyTrace+ software light source calibration routine providing a convenient display of measured values during the light source calibration process.